McCullers re-signed with the Steelers on a two-year deal Thursday, Jeremy Fowler of ESPN.com reports. Analysis: McCullers played in 15 games last season, but recorded only five combined tackles and one sack. He'll return to the organization he's played his entire five-year career, where the 26-year-old will provide interior line depth and likely resume his regular role on special teams. McCullers did not record a tackle during Sunday's 16-13 win over Cincinnati. Analysis: The big defensive lineman played just four snaps in the season finale and finished the 2018 season with five tackles -- including one sack -- in 15 games. McCullers is an unrestricted free agent who serves as roster depth. McCullers (ankle) is absent from Wednesday's injury report, Teresa Varley of the Steelers' official site reports. Analysis: McCullers sat out Pittsburgh's win over the Panthers in Week 10 due to an ankle injury but appears to have fully recovered. Barring any setbacks, expect the depth nose tackle to play a limited defensive role during Sunday's game against the Jaguars. McCullers (ankle) has been ruled out for Thursday's matchup against the Panthers, Jeremy Fowler of ESPN.com reports. 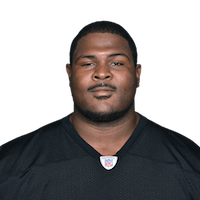 Analysis: McCullers will join Marcus Gilbert (knee) as the only two Steelers not playing in Thursday's contest against the Panthers. The Tennessee product logged a limited practice Monday but was unable to practice Tuesday and Wednesday. 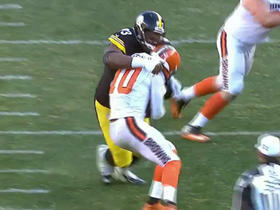 Pittsburgh Steelers defensive tackle Daniel McCullers wraps up Cleveland Browns QB Robert Griffin III for sack. 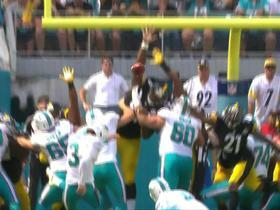 Pittsburgh Steelers defensive tackle Daniel McCullers blocks Miami Dolphins field goal attempt.